The Leica Disto S910 and TRI 200 Pro Pack includes the S910, TRI 200 tripod, a tripod soft bag with shoulder strap, and the FTA 360-S fine tune adapter. The S910 is the first LDM that captures multiple, accurate measurements in three dimensions from a single location, radically improving the efficiency of common measuring tasks. 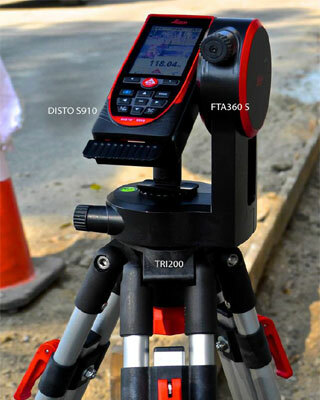 Even with a tripod and outdoor point finder camera, placing your laser point exactly where you want it can be challenging, especially at longer distances. The FTA 360-S is a micro-adjustable tripod adapter. Point and shoot to get close, then tweak the knobs ever so slightly to adjust your spot by millimeters.